The Japanese Art of Stone Appreciation is an exploration into the art of suiseki-small, naturally formed stones selected for their shape, balance, simplicity and tranquility. Written by two leading experts in the field of Japanese gardening and art, this concise introduction offers aesthetic guidance and direct practical advice that is a window into traditional Japanese culture. It details the essential characteristics of a high-quality suiseki, describing the various systems of stone classification in this Japanese art form and explaining how to display a suiseki to its best advantage. 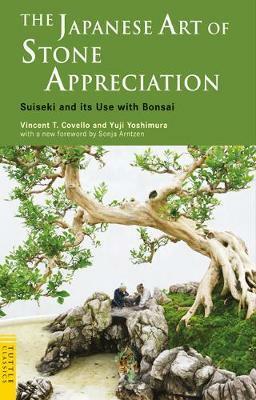 There is also a section on incorporating suiseki alongside a bonsai tree, the most popular and rewarding complement to peaceful suiseki miniature landscape gardens. The Japanese Art of Stone Appreciation is a thorough introduction that provides: a complete 'how-to' guide for collectors; a primer on key Japanese concepts and terminology; advice on displaying stones to their best advantage; hints on combining suiseki with bonsai; and much more. Vincent T. Covello received his B.A. and M.A. from Cambridge University in England and gained his Ph.D. at Columbia University in the United States. The author of several books, he has been a Professor at Brown University, a study director at the National Academy of Sciences, and program manager for the National Science Foundation. Dr. Covello has studied the art of suiseki for over twelve years and has lectured extensively on the topic. He is considered by many to be the foremost authority on suiseki in the United States. Dr. Covello is also an expert on the Japanese tea ceremony. Yuji Yoshimura is recognized as one of the world's leading experts on bonsai, Japanese horticulture, and miniature landscapes. A graduate of Tokyo Horticultural School, he has lectured throughout the world and has published numerous books and articles on bonsai in both Japanese and English. He is the co-author of the first authoritative book on bonsai in the English language, The Japanese art of Miniature Trees and Landscapes. Sonja Arntzen has taught at the University of Alberta and the University of Toronto. Recently retired, she is working on a new translation of the Sarashina nikki and a history of Japanese women's writing, as well as doing a lot of gardening. She is the author of Ikkyu and the Crazy Cloud Anthology (Tokyo University Press, 1986) and The Kagero Diary (University of Michigan, 1997).